What Happens to a Women's Body at 40? Anti-aging websites promise that drinking grape juice every day will take six years off your age and that deep breathing can make your skin look years younger. And they may be right. But sooner or later the inevitable changes to your body will occur. Midlife changes occur somewhere between the ages of 40 and 65. For many women, this period offers an opportunity for new perspectives and new paths in their lives. Both men and women begin to lose muscle tissue as they age, with the average amount of about 1/2 lb. per year for women beginning at 40, according to Dr. Pamela Peeke, author of "Body for Life." When you lose muscle, your resting metabolism dips and you burn fewer calories, leading to typical weight gain after age 40. Up until you are 35 or so, you maintain bone density at about the same rate that you lose it. But according to Miriam Nelson, Tufts University professor and author of "Strong Women Stay Young, " with every passing year after that time you lose up to 1 percent of bone every year. Strength training and weight-bearing exercise not only stops bone lose, but it can actually build bones as well as making them stronger and denser. Your chance of being diagnosed with breast cancer was one in 233 when you were in your 30s, but increases to one in 69 for ages 40 through 49, according to the National Cancer Institute. Despite recommendations from the U.S. Preventive Services Task Force in 2009 that women can wait until age 50 to begin annual mammograms to detect breast cancer, doctors and researchers at the Mayo Clinic still recommend them for women beginning at age 40. 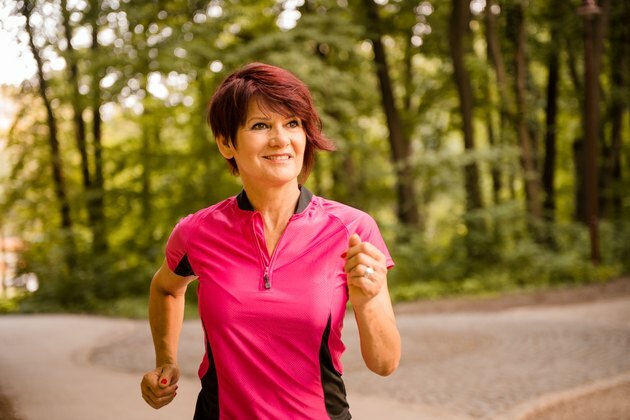 According to Dr. Judith Reichman, author of "Relax, This Won't Hurt," the average age for the onset of perimenopause is 47, but it can occur sooner or later. This transitional period between your reproductive life and menopause is characterized by lower estrogen levels and lower levels of other hormones as well. You may experience occasional hot flashes, changes in your menstrual cycle or sleep disturbances. As your thyroid ages, it can begin to function less effectively and either produce too little or too much of the thyroid hormones, causing symptoms such as weight loss, intolerance of cold or heat, fatigue, and alternating constipation and diarrhea. Also, your pancreas might lose its ability to process insulin as efficiently as it once had and your blood glucose levels might rise, causing diabetes.